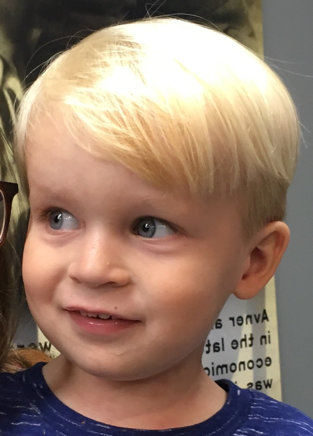 Haircuts can be traumatic, but especially when it’s your first in a barber shop. That’s precisely what our two-year-old grandson, Abe, was facing. His flowing blond locks may have been adorable, but they were increasingly impractical. Alli, our daughter, met Mary at the selected shop and the process began. 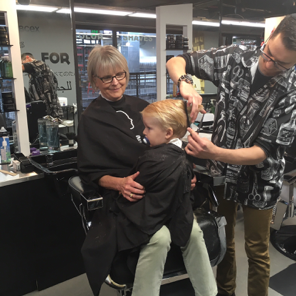 When it was Abe’s turn on the chair, it became immediately obvious that he wasn’t going to allow a complete stranger with a comb and a scissor to come anywhere close to him. Case closed. Alternative plans began to formulate, and a solution was drafted. Mary, Emmie in this case, would occupy the barber chair first. The familiarity of her waiting lap would provide a significantly more inviting platform for the task at hand. The plan worked. Mary, as a booster seat with arms and a familiar tenderness provided the reassurance that Abe needed. The situation was unfamiliar and unsettling… but Emmie was there. He trusted her. He should and he could. Her arms provided security even while a complete stranger rotated around his head. Fear submitted to love. Defiance surrendered to tender proximity. An objective needed a companion, an advocate, a lap, arms and a familiar voice. Life is frightening. There are many unfamiliar barber shops… filled with strangers with scissors. This is why God instructed us to provide the arms of confidence. This is why Jesus talked about caring for each other. It’s precisely why Jesus didn’t simply instruct little children… no, He swept them into the safety of His arms and then He valued and treasured and taught them. In the classroom of tender proximity. Fear doesn’t disappear, it just needs a trusted companion. Emmie. Jesus. I need arms… every day. I need a gentle whisper, a familiar voice. Proximity. This inspires me, even as it breaks my heart. So many scissors. So few Emmie’s. Do you feel the call? Can you be? Will you be? In the arms of Emmie.